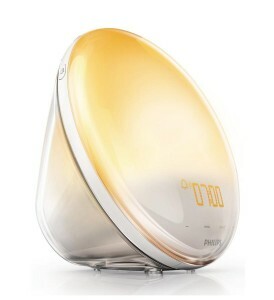 Home / Articles / Which Philips Wake Up Light is the Best? 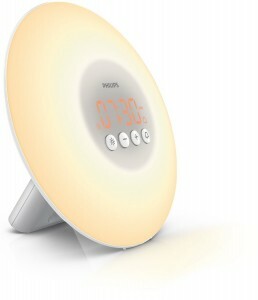 Philips has several wake up lights (also called dawn simulators, sunrise clocks, etc.) designed to suit a variety of needs. Choosing the right one may not be obvious at first glance, so I am here to help! Read along as I point out the feature and price differences on these models to help you make the right choice in in which Philips Wake Up Light is the best. 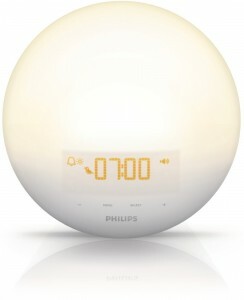 The Philips HF3520/60 is the flagship Philips wake up light model. This device has the most features (and the highest price tag), but it is also the top seller on Amazon. This model is set apart from the others below in that it has a colored sunrise simulation which starts in a glowing red color, transitioning to orange, and finally to bright yellow, matching the dawn of the Sun as closely as possible. This model also offers touch controls and tap to snooze, which the other models do not. In addition, this model has the most wake up sounds (5 nature sounds and FM radio), two separate alarm times, and boasts a light output of 300 lux. If you’re looking for the best dawn simulator, regardless of price, this is it! One step down from the premium HF3520/60 is the Philips HF3510/60. This model is very similar in shape, size and features, with a few key differences. The 3510 does not have the same colored sunrise simulation of its big brother. 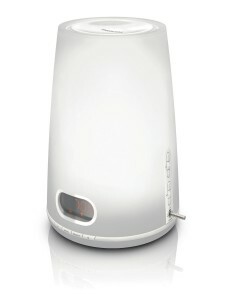 This model has the same FM radio feature, but only has 3 natural wake-up sounds to choose from and only one alarm time. The light output is the same as its big brother. If you’re looking for something a little more bare-bones, but still want the FM radio functionality, Philips offers the HF3506/66 and HF3506/65. These models are essentially the same, the only difference being the /65 model has silver trim, while the /66 model has black trim. These models feature 2 “natural” wake up sounds in addition to the FM radio. With these lower end models, you’re getting reduced light output at only 200 lux (vs the 300 lux of the more expensive models). At last, the least expensive dawn simulator option from Philips, the HF3500/60. 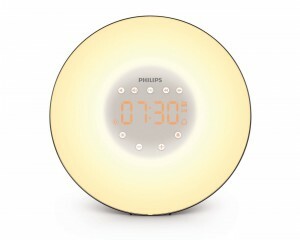 This is the most simplistic Philips wake up light, offering only 1 wake up sound (a gentle beep, as opposed to nature sounds), and only 200 lux of light output. If you’re in search of a simple light that comes on when you specify and doesn’t have any bells and whistles to content with, the 3500 fits the bill. Philips’ now-discontinued HF3470 may be one to consider if you’re searching the used market on eBay or CraigsList. This wake up light has a very loyal following, and many believe it to be better than the current line-up of LED-based dawn simulators due to its replaceable halogen bulb.